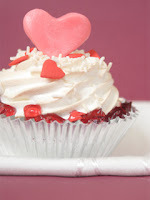 Impress your friends and family with Valentine cupcakes so beautiful that you won't want to eat them. Use the tricks that our Wilton certified instructor gives you to create a work of art to display proudly at your Valentine's Day party. The instructor will contact you with a list of items needed, including 6-12 cupcakes. Pre-register only. No walk-ins. Tuesday, Feb. 8th 2011, 6:00 pm - 8:30 pm $15. Click HERE to register. For more classes like this, visit Granite Peaks Education website.